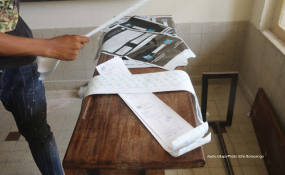 An election looks at the results sheet from digital counting of ballots at a polling station on December 31, 2018. The African Union Commission takes note of the decision of the Constitutional Court of the Democratic Repubic of the Congo proclaiming the final results of the presidential and national and provincial and legislative elections of 30 December 2018. The Commission calls on all concerned to work for the preservation of peace and stability and the promotion of national harmony in their country. The Commission reiterates the continued availability of the African Union to accompany the Democratic Republic of the Congo in this critical phase of its history, as well as its solidarity with the Congolese people. It should be noted that the visit of the high-level delegation to Kinshasa on 21 January 2019 has been postponed. The February 2019 Summit of the Union will receive a report on the efforts made, in solidarity with, and support to, the people of the Democratic Republic of the Congo. Read the original article on African Union. Copyright © 2019 African Union. All rights reserved. Distributed by AllAfrica Global Media (allAfrica.com). To contact the copyright holder directly for corrections — or for permission to republish or make other authorized use of this material, click here. Africa: The Chairperson Received the Credentials of Incoming Special Representative of the UN Secretary General, He Hanna Tettah.